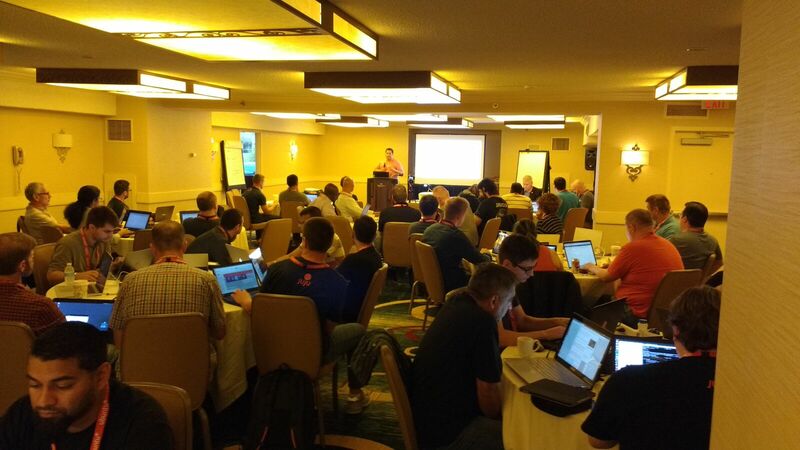 Last week members of the Juju community gathered in Washington DC for the first ever Juju Charmer Summit. The goal of the summit was to help our users better understand what’s happening in the Juju community and be able to grow their skills, and for us it was a tremendous opportunity to collect real-world feedback on how people use Juju. One of the first things we announced as part of the summit is the beginning of our charm developer program, which offers free cloud instances to anyone who is writing charms for the community. We’ve already got a great number of people signing up, and we’re looking forward to seeing what people come up with. The summit was high energy, with over 50 attendees and dozens of topics discussed. The schedule of events has a list of what was discussed. We’d also like to the thank the following organizations for attending and supporting the summit: Capital One, IBM, RSA, Big Switch Networks, Dark Horse Comics, Verizon, CodeFutures Inc, Alliance Technology Group, University of Ghent, University of Peru, Weave, RM Solutions, Juniper Networks, Cloud Services, PBS Digital, Quasardb, VroomConsults, Canonical Ltd, and Silicon Valley Data Science. Please note that the slides probably won’t make too much sense without the video, however we are currently editing the recorded sessions and will publish them to the public as soon as they are available. Preparations are already underway for a second summit, thanks, and see everyone in the New Year!